I arrived back in Sydney yesterday after spending 6 days in Tokyo with our Japanese partners Yusuke, Yuka, Taka and Jun. Amongst many fun and productive activities on Monday night we visited the Tokyo NikeID store together. We sell custom shoes but because all our shoes are designed for women, I've never had the opportunity to design and order a pair for myself! I'd like to note here that Mike and I designed our gladiator heel which has been our best selling design, a point of contention with Jodie. ;) And I may or may not have tried on a pair of these in size 44 which we had in the office at one point. But I digress, my point is I've never been able to design a pair of shoes I could wear day to day for myself, so I wanted to try that out in the NikeID store. The NikeID store in Tokyo is a fantastic retail experience. The merchandising is beautiful with exciting, light filled displays of shoes arranged in colour blocks. You then walk around to a row of Apple computers all set up with the NikeID online designer loaded on them. A staff member activates the computer for you and you're away designing. They have samples of all their materials on large metal rings that you can browse through and sit next to each other to get an idea of how the colours go together. The staff member was happy to help us out and it was a really fun experience designing the shoes together with Yusuke, Yuka and Taka on a large screen. Yusuke mentioned Shoes of Prey to the NikeID staff member and she'd seen us on a TV segment in Japan a few weeks ago which was nice to hear. Many of our customers tell us when they order their first pair of shoes that they already have a number of other designs they're planning to order. I experienced the same thing, I loved the combination of blue and yellow, but I wanted something interesting that would go with my black jeans and black jacket. So I decided to put the blue and yellow idea on hold for next time and went with a base of black. NikeID have you start from one of 80 shoe designs, then once you have selected the design you can't change the structure of the shoe, only the colour. They also had two colour palettes for the shoe I selected and materials from one palette couldn't go with materials from the other palette which was a little confusing at first. Those were probably the only two downsides compared with Shoes of Prey, the rest of the experience was fantastic. The image of the shoe in their online designer is near photo realistic. Despite having 100's of sample pairs of shoes in the room with us, and swatches of all the materials we quickly found ourselves transfixed on the screen not bothering to see how leathers matched up against each other. It was so much more fun seeing the near photo realistic image of the shoe change as we adjusted the design. That's definitely something we need to improve upon with our online designer. The challenge for us is that we also allow customers to change the structure of the shoe. 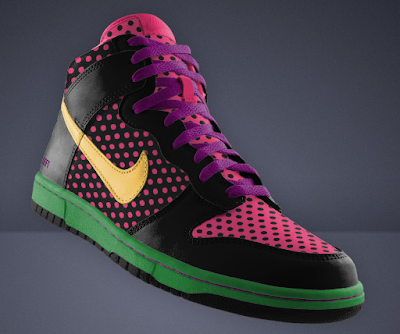 NikeID can take a few seconds to load a high quality image of a shoe, then they just change the colours in and out. That's much more simple to do than what we're attempting for our customers. As web technology improves we'll need to continue exploring improving our designer because our drawing look is a long way from Nike's photo look. 1. You can choose a second set of laces. I went with purple for my main set and ordered a pair of green laces as my second set. 2. You can choose text to be written on each shoe. Yusuke jokingly suggested "Left" and "Right" might make it easy for me to remember which shoe was for which foot. I thought I'd be "funny" and went with 'Left' on the right shoe and vice versa. They had a number of materials that were exclusive to that store only, offering an even more unique design experience. They have a folder full of little cards with images of all the shoes people have designed in the store, including the customer's name and the name they gave the shoe. A little piece of me wanted to have my shoe in that folder. After I placed my order they printed an image of my shoe onto a plastic, credit card sized card. This is now in my wallet and I've shown it to a number of people which promotes NikeID. If I wear my NikeID shoes into the NikeID store within 3 months of receiving my shoes, I get a discount on my next pair. All good food for thought should we go down the offline retailing path ourselves in the future. I have to say, I thoroughly enjoyed the NikeID experience. After 18 months I finally experienced the same excitement that our customers describe to us when they're ordering their shoes. I knew logically that designing a pair of unique shoes for yourself is exciting but it was great to experience that for myself. After placing my order I then had a second experience similar to that of a Shoes of Prey customer. The staff member explained that shipping normally takes 2-4 weeks, but that with Chinese New Year approaching my shoes might take a little longer! That was definitely disappointing to hear. We're currently communicating an 8 week turnaround to our customers, up from our normal 4-5 weeks. Logically I know this is disappointing but it was fascinating to actually experience that myself. The next day I showed Jodie a picture of my shoe. She politely informed me that I had done what the occasional Shoes of Prey customer does and had gone a little crazy with my new found designing power, she said a green sole, purple laces and pink polka dots on my shoe were all too much! Now I admit that does sound crazy, and I will admit that the shoes do look a little crazy, but hey, I wanted something different and unique to go with my black jeans and black jacket and I'm pretty sure I'm going to get it! Anyone else ordered from NikeID and what do you think of my shoes?! Mate this is awesome (the post, not the shoes j/k)! Perhaps once you crack how to get the structure of the shoe to change, you can license it and then sell it to Nike! Nikeid has actually been around for few years now, but i never knew they've an offline store. Also, how much did the high-dunk cost u? You shoes look like my sweaters. I'll ignore the bit in brackets Saf, that's a +1 for the shoes. Anonymous - I'm interpreting stopping traffic as a +1. They were about $220 once converted from Japanese Yen I think. Andy - your sweaters rock, even Jodie would agree on that one so that's definitely a +1! Great article. I can feel the excitement in your writing. Cool to see the finished product too. All I can say is that you are lucky there is no such thing as the "fashion police" or you would be locked up for a very long time! Nootn - I will wear them around to your house and I bet Lyra loves them!